EASTER is a time of chocolate eggs and hot cross buns... an extra day or two off work for most people... and perhaps some sort of religious occasion. It seems a little disappointing that I think of that last, considering it's not just the reason for Easter, It Is Easter. Anyway, regardless, it's common knowledge that most of us indulge a little over Easter. Those little chocolate eggs add up and then we're eating them every chance we can (an after lunch treat? Mid morning nibble? Dessert after dinner?) and end up feeling below our best. So I wanted to offer a special combo package that might be the nudge you needed to book in a consult (or two) with me. 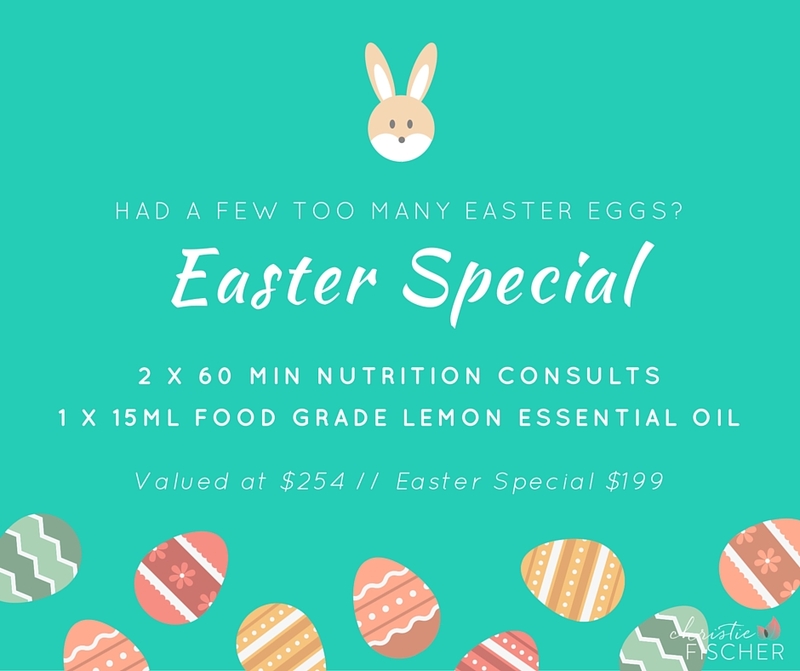 2 x 60 min consultations with me (on skype) ~ we will cover whatever may be bothering you at present... bloated belly, sugar cravings post Easter, skin issues, digestion sluggishness, weight issues, you name it! And I'll give you a personalised prescription that is a combination of dietary recommendations, lifestyle changes and habits, hydration, supplement suggestions, and more. 1 x 15ml bottle of food grade lemon essential oil ~ this is much more effective in your morning water than squeezing the juice of a lemon, which wears away the enamel of your teeth. I never recommend lemon juice in water. Lemon oil is cleansing, alkalizing, and contain compounds that are beneficial to our liver, which in turn makes our daily detoxification processes happen easily and smoothly. This bottle will be posted to you at no extra cost. Easter Special Only $199. Usually $245. * Valid until May 31st, 2016. Email me at christie (at) christiefischer (dot) com, or send me a private message through my Facebook page. I look forward to meeting any newbie clients, and all current clients can also purchase this special.